« "NEX" is Gone, so What do we Call It? The spec-lovers are going crazy. "24 or 36mp! Full frame! Sony is going to crush Olympus!" As with any hyped-up announcement—and Sony appears to have made a fairly extensive leak campaign to help create the buzz for the actual announcement—the hype exceeds the reality. No doubt the A7 and A7r are very good cameras. But you heard it here first: they're going to get a fairly quick readjustment from hype to gripe once cameras ship. That's actually one of the sine waves I write about: if you over-hype something and get the press 100% on your side prior to launch, you're going to get slammed for even minor things when the press discovers that reality doesn't quite match the over-eager expectations. Witness the Sony QX models, which were amongst the most hyped ("savior of compact cameras") products so far this year, but when the products got into reviewers' hands, they became the most slammed. Fortunately the A7's are better than the QX's in execution, but they are going to see a "hype adjustment" soon. The three things the Sony A7 cameras will get slammed for: (1) less than state-of-the-art focus performance; (2) side-to-side issues with legacy lenses on adapters; (3) lack of lenses. In all likelihood, we'll also see negative comments about battery life, size of lenses, frame rate (only 1.5 fps with exposure and focus), and a few other things, as well. This is the way the Internet Amplification Effect works now: over-hyped, over-griped. The reality is always in the middle, between the hype and the gripe. But my purpose here today isn't to pre-gripe a product that isn't released yet ;~). Instead, I want to address the "Sony is going to crush Olympus" remarks I keep getting. I'm tempted to just write "with what lenses?" but it's far more nuanced than that. First, Olympus is more likely to crush themselves then someone else doing so. The E-M1 is a very good camera. Fast and responsive focus, state-of-the-art small sensor performance, a deep degree of customization and user control, all in a small package that takes small lenses that are proven excellent (most of them, that is). At the moment the E-M1 is a more well-rounded camera than the A7, especially when you consider its performance with the older 4/3 lenses via adapter. The E-M1 is probably the one mirrorless camera right now I could say could replace a full DSLR set for many. The camera is up to snuff, and the lenses from fisheye to 500mm equivalent are all there and perform well. "But it's only 16mp and a smaller sensor," the skeptics all say. Very true on both points. Do those skeptics fully understand how equivalencies work? Probably not. 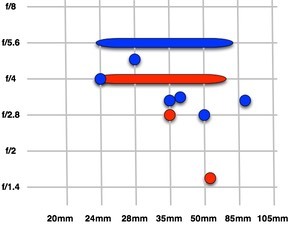 On the right is a plot of the Sony (red) and Olympus/Panasonic (blue) fixed aperture lenses in the mid-range adjusted for sensor size. Other than the Sony 55mm f/1.8, there's less than a stop difference between all the rest, and Sony isn't always the winner. Especially so since there are few Sony choices available in the near term. Thus many of the Sony Proclaimers are probably comparing the future sensor/lens climate to a current sensor/lens climate and declaring victory. 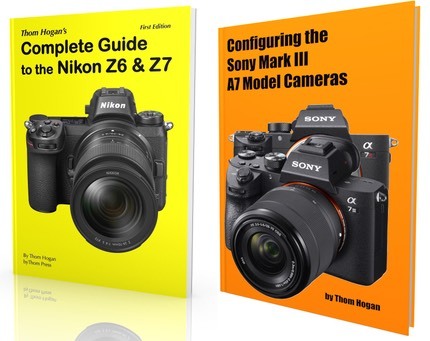 One of the things I've noticed in the pre-ordering stream for the Sony cameras is that the A7r seems to be out-pulling the A7. This is the D800 pre-ordering paradigm all over again. I think that a lot of people are buying on a single specification (megapixels) and thinking "this will be my last camera for a long while because it has so many pixels I can skip a few generations." In essence, they're overbuying to their needs. Unlike the D800, however, I'll bet that the A7r gets dinged for something significant, most likely focus speed, once it actually hits the market. But I'm actually a bit far from my point: the declarers of "win" and "loss" tend to live in a world that has black and white comparisons. Sensor size? Larger. Pixels? More. Hmm, where are the rest of the differentials? Frame Rate? Less. Focus Performance? Less. Lens Choice? Less. Price? More. Successful products are the balance of things, not one or two things isolated from the rest and highlighted. And that's one reason why the Olympus E-M1 should continue to do okay. It's a great balance. I happen to think that the only company that can crush Olympus at the moment is Olympus. While they've produced three very good mirrorless cameras in a row (E-M5, E-P, E-M1) and continue to iterate their lenses, they definitely haven't shown that they're out of the woods yet. Olympus' biggest problem is that the camera group is a cash drain and the company needs more cash. My sense is that the camera group has responded with some compelling products, but they simply don't have the unit volume yet (especially at the higher prices Olympus is charging for these latest cameras) to move the market share bar and generate the cash needed. The danger at Olympus is that they've made all the right design choices but haven't gained enough momentum in the market to take advantage of them. Here in the US, cost cutting has resulted in cutbacks in marketing, dealer handling, and even repair, which isn't helping the cause as it decreases their visibility in a market that's already tough for mirrorless. Would Olympus' future be any different without the Sony A7/A7r introductions? No. All the same problems would still exist. The Sony introductions are really more of another marketing hurdle to get past than anything else. The real question is how long can Olympus tolerate a negative cash flow or ROI in cameras? One year, two years, forever? No one knows the answer to that other than Olympus, and I'm not sure they know for sure, either. As I noted in an earlier article: if you bring out a new system and start from scratch with lenses, so can everyone else. You might gain a few month's advantage, but unless you have something proprietary you can keep the others from, everything will wash out to a center position very quickly. Put another way, if Nikon, Olympus, and Pentax all had full frame mirrorless using the Sony sensors (and probably Canon with their own sensors) by the end of 2014, would the Sony A7's look all that great? So I judge Sony's advantage to be temporal, and some of that advantage is excessive pre-release hype compared to where the product actually performs. Temporary wins are the worst kind. What you really want in the camera market is a camera that sells well for two, three, or four years. The Nikon D800 is one of those cameras. The Canon 5D is another. The Olympus E-M1 might be, though it remains to be seen as there are people holding off because they're worried about Olympus' commitment. I'm not so sure the Sony A7's are three year cameras. Too much of the tech in them seems like it'll be pushed forward quickly.